Every YN-560 is compatible with both Canon and Nikon. You don't need to buy a different flash for either brand. 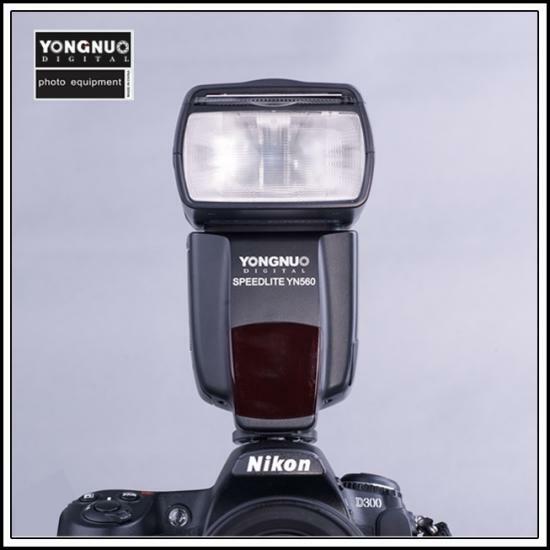 The Yong Nuo YN-560 speedlight is somewhat of a legend among flash photographers. Traditionally, any external flash for a DSLR cost at least $300. You may have also seen this price tag the last time you went to the camera store. The YN-560 flash is a knock-off speedlight that mirrors many of the design and functional features of the expensive Canon and Nikon flashes, but the question is… is it as good as the name brand flash units? First of all, this is one of few cheap flashes that has an automatic zoom (restricts the beam of the flash to make a tighter beam of light). The zoom range on this flash is from 28 – 105mm, which is very respectable. In fact, many cheap flashes don't have ANY zoom function! Second, the YN-560 offers a fantastic recycle rate. That means the time it takes for the flash to be ready to fire after flashing. The recycle rate seems to be on par with many of the more expensive flash units available. I can often fire 3 flashes in a second as long as the power is lower. When set to full power, the flash will take about 2 seconds to fire if you're shooting a lot. Third, this flash has a strong flash output. Flash output is measured by something called the guide number. Without too much technical information, suffice it to say that the YN-560 offers a guide number of 58 at 105mm and ISO 100. If you know about flash, that will be meaningful to you, and if you don't, then just understand that it's pretty good. What's missing in the YN-560? To me, the one feature that is missing more than anything else in the YN-560 is high speed sync. This is a new technology that allows photographers to use shutter speeds of faster than 1/250th with a flash. For more on this topic, read about flash sync speeds in this previous post. The YN-560 flash is purely manual. That means that it cannot receive exposure information from the camera and adjust the flash output automatically. This may seem like a serious flaw in the product to photographers who are new to flash, but many (or most?) flash photographers prefer to shoot with manual flash. It takes very little effort to simply press one or two buttons to alter the flash output, and the benefit is that it makes using flash much simpler to learn. The flash is not nearly as durable as the name brand flash units. It should come as little surprise to you that this off-shore knock-off of the name brand flash units is not built with as durable of materials. I have owned a few of these YN flashes for over a year and a half without any problems; however, I have also heard several reports of the zoom function in the flash breaking soon after purchase. Should you buy the YN-560 or a Canon or Nikon flash? For 99% of photographers who are just getting started out with flash, I would recommend the YN-560 flash over the Canon (such as the 580EX II) or Nikon (such as the SB-800). I like this flash for its simplicity, great feature set, and flash output. This flash is ideal, in my opinion, for pairing with an umbrella and a light stand for more creative or formal shoots. If you're interested in getting started with flash, I would recommend this flash whole-heartedly. However, if you shoot weddings, events, or other settings where you will keep the flash attached to the top of the camera and you want to be able to shoot quickly in different lighting situations, then I would suggest the Canon or Nikon flash. In these situations, it will be simpler to use ETTL/iTTL mode and not have to set the flash output or zoom for each shot. Where can you buy the YN flash? The YN used to only be available for sale on eBay, but it is now available on Amazon.com. Amazingly, it sells for about $65. That's an incredible deal for what you're getting. You could buy 7 YN-560 flashes for the same price as the Canon 580EX. Given that choice…. I'd choose the 7 YNs.